cement/sand/gravel for a concrete tank (water storage), a water point and toilet. MiVAC also supplied cement/sand/gravel to concrete the floor of the Police Station which includes an office, sleeping accommodation for 6 to 8 Policemen and an outdoor eating area. Messrs Yang, Moua and No (aka Mr Carpenter) assisted the Police with the construction by providing their building expertise to supervise and assist with the work. The project was completed about 12 months ago. On Thurs 17 July Dawn, Yang, Vang, Moua, No and I attended a luncheon hosted by the Chief of Police at the Na Luang section Police Station to celebrate the completion of the work and to thank MiVAC for its assistance. After the jovial “meet-n-greet” at 9:30am, we inspected the work that had been completed then watched as the Hmong and Lao played pétanque (a form of lawn bowling originating in France, played on rough ground using steel balls). At about 11am the Lao whisky appeared and everyone had a few shots in preparation for lunch. Twelve people sat down for Lunch which consisted of sticky rice, a chicken broth (served in a communal bowl) and pieces of boiled chicken. The BeerLao was served then the Chief of Police made a moving speech thanking MiVAC for its assistance and calling on both MiVAC and the Police in Phoukood District to strengthen its bonds of friendship and undertake many more projects together. I responded with an equally moving speech promising many more cooperative ventures which was duly interpreted by Yang. The six people who had a glass then toasted on BeerLao before passing their glass to the next person to toast. Dawn was the only women present and her preference to drink a shandy seemed to amuse the Hmong and Lao. Because she was the only women, she was allowed the privilege of retaining her glass whilst the men shared. Following lunch and many beers, a couple of the Lao Police were spurred by the emotion of the occasion (and the shots of whisky pre-lunch) to jump to their feet and toast MiVAC. After lunch Dawn and I were challenged to a game of pétanque which we duly accepted …. and were pretty badly beaten. Then things got serious. The Chief of Police and the current Policeman at the MiVAC Base (we employ a policeman to be stationed at the MiVAC base on a permanent basis – the policemen are rotated on a monthly basis) challenged Yang and I to a game … with drinking penalties for bad shots. Having never played before I was doing more than my fair share of drinking. However I soon got the hang of the game resulting in a win for Yang and I in game 1. We went down in game 2 and were narrowly beaten in game 3. A constant during the afternoon was the ever changing rules, with much drinking and exuberant celebrations after every shot. With the pétanque completed, we played the egg game where two dozen or so eggs were placed on the table to eat. A game of luck they called it. Only half were cooked so the fun came in watching those who selected a raw egg eat it. Of cause drinking BeerLao is the obvious thing to do when eating raw eggs!!! By 4:30pm we felt we had played enough pétanque, drunk enough BeerLao and eaten enough eggs to depart without offending anyone so Vang (designated driver) drove us back to the Ban Xai Base where we had another BeerLao accompanied by more eggs with the Chief of Police who had followed us. In between mouthfuls of BeerLao, he composed and sang us a song about MiVAC’s great work in the past and future. 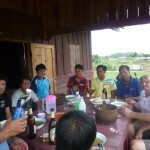 By 6pm we left Ban Xai having made new friends and established a rapport with Yang and the local Lao police. It was a very interesting and fun day and we learned a lot about how to interact with Hmong and Lao people.